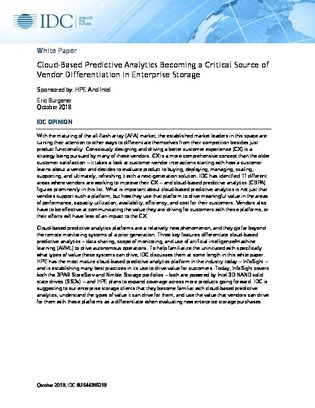 As the all-flash array market continues to mature, storage market leaders are turning to cloud-based predictive analytics platforms to differentiate from the competition. Three key features differentiate cloud-based predictive analytics — data sharing, scope of monitoring, and use of artificial intelligence/machine learning (AI/ML). How effectively a vendors uses these features to drive value varies significantly. Download this IDC report to understand how your organization could benefit from such storage offerings in terms of performance, capacity utilization, availability, efficiency, and cost.